Here's one way to make a 3/32" groove for a very tiny box lid and bottom. I decided to build a box for the reference ruler, but working with 3/16" mater ial can be a challenge, unless you're a miniaturist. Since I learned to make scratch stock, it's become the solution on a number of occasions. One benefit to using scratch stock is you can make profiles that do not exist in router bits. Or, if they do exist, they risk tearing out the wood on such a delicate project. 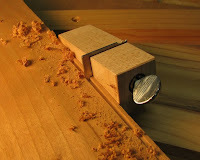 With scratch stock, you can work in both directions, so you are always working with the grain; you can work slowly; you won't burn the wood, as is the case sometimes with router bits; and you can cut multiple profiles on the same blank by utilizing each corner. 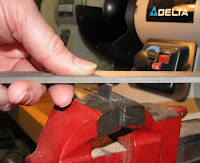 For blanks, I use old band saw blades I picked up—for free—from a lumber yard that was throwing them out. 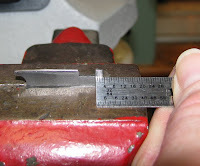 With a tiny profile like this, it was easier to use the edge of a file as a saw rather than a hacksaw to create the 3/32" wide tooth needed to r out the groove. You can use layout fluid to mark your shape, but a pen worked fine in this case. Once the profile was filed, I honed the shape flat on all surfaces with waterstones. 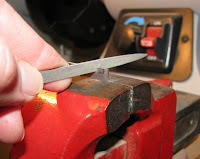 You need very sharp edges for scratch stock to work well. It took about an hour to make the cutter, but routing a groove takes only minutes.